It was midday when we arrived, tired, scratched, bleeding, battered and bruised. A smiling face offered chilled damp facecloths and directed us to a tableful of juice, cold drinks and water and then to a line of sturdy canvas chairs into which we slumped gratefully. Who in their right mind would put themselves through this agony willingly, I wondered, and knowing that this was only day two of four, how was I going to survive another two? Where were we? Climbing Everest? Shark cage-diving? The Funfair at the Rand Easter Show? No. Cycling. The world’s fastest-growing sport. And we were at Mashatu in Botswana’s Tuli Block. I had always thought of chafing as a culinary term until now but today no amount of gel on my saddle or padding stuffed down my spandex could prevent a new interpretation dawning on me and my nether regions. We’d been on our bikes since just after dawn and had covered about 40 kilometres, which would have been a doddle on-road but in these conditions was far from it. My doddle was, in fact, completely doddled from hours of bashing through the bush, tearing down elephant paths through the mopane, struggling through soft-sand riverbeds, splashing through streams, dodging boulders and bouncing across rocky drifts. “The lekgotla is ready for you.” The smiling face was speaking again. It belonged to Annelien who, with her husband Stuart, was our host for the rest of the day. “Lunch will be ready in 30 minutes.” Good. We were ravenous. The “lekgotla” consisted of a circular enclosure of leadwood shafts embedded in the ground under the shade of a giant mashatu tree. Once the gathering place for the tribal elder deliberations in this corner of Botswana, it had been transformed into a dormitory. Around an unlit fire stood a ring of beds. Yes, real beds; decked with cotton sheets, proper blankets and pillows. It was outlandish and fabulous, reminiscent of the album cover of Pink Floyd’s A Momentary Lapse of Reason, which seemed strangely apt, as we all picked one and collapsed onto it, groaning with pleasure now that the weight was off our calves, thighs and aching backsides. Then it got better. A corridor of trees led from the lekgotla to four hot showers and a couple of flushing lavatories. I ride a mountain bike regularly and I knew Mashatu was famous for its annual Tour de Tuli but this was my first ever cycling safari. My first foray into the world of camelbaks, gel packs, jelly babies and energy bars. We were on a tailor-made route which would have us sleeping in three different venues. The mornings were spent cycling an often circuitous route between those camps and on each afternoon a different activity was lined up for us. There were bush walks, bird-spotting and game drives, architectural sites, Anglo-Boer war battle-sites, elephants at a hide and drinks on the banks of the Shashe river. We walked in the shade of Botswana’s own Mapungubwe, climbed kopjes, strode floodplains, unearthed shards of ancient pottery, strutted with a secretary bird, ate sumptuous brunches, marvelled at magnificent landscapes, perched on hilltops at sunset with a glass of wine in hand, witnessed Rhodes’s initials carved in a baobab, drove alongside a stalking leopard in an open vehicle, dined on the finest fine fare around fires under the stars and more than anything, enjoyed the incomparable company of efficient, charming and amusing Batswana people. We followed our intrepid and inexhaustible Motswana guide Joe through vast herds of impala, scattering wildebeest and passing up-close huge gangs of root-grubbing baboons. One morning, a pair of hyena wandered nonchalantly past us in a riverbed as we rested on the bank. Back-of-mind was the ever-present knowledge that Mashatu is also home to lion and large numbers of leopard. There were elephants everywhere. The heavily-treed section through the riverine bush is not called Ambush Alley for nothing! The cycling is off-road but varies greatly from relatively gentle level single-track on game paths to tricky technical cycling across boulder-strewn hillsides. Joe would tell us at the beginning of each ride what to expect and what our nett climb or descent for the day would be. He was cunning, too, in his encouragement and harmless disinformation when it came to our probable arrival time at our camp for the night. Our second overnight stop was Mashatu Tented Camp, only metres from Zimbabwe on the Tuli Circle, an anachronistic border established by the pioneers to protect the grazing in a ten-mile radius of Fort Tuli in what was then Rhodesia. The camp’s canvas-roofed rooms look out from large verandahs onto the riverbed and a cacophony of birds while, out back, a spacious courtyard leads to an outside shower. The crowning accommodation experience was our last night at Mashatu Main Camp. By now, we had covered well over a hundred kilometres, the last couple of hours at speed. More welcome than ever was the row of smiling faces, facecloths in hand and ready to whisk away our bicycles for the last time and lead us on winding gravel paths to vast rooms and wallowing baths. An afternoon game drive would give our rear ends a final pounding before we took drinks in the bar overlooking a large waterhole and another fine dinner, this time in a boma. The trip was hard work, make no mistake! We were mostly of average fitness and none of us – even those who cycled regularly – found it easy going but the rewards were phenomenal. You will fall off your bicycle and you will hurt yourself, your legs will ache and your back will twinge but the pain is more than made up for by the privilege of bonding with a group of like-minded folk and experiencing the thrills and hardship of a bicycle work-out in some of the most spectacular game-viewing land in Africa. Just get fit. And don’t forget the sunblock, a helmet, the sticking plasters, and as much padding as you can get your hands on to keep the chafing to a minimum. Everything else you can leave to Joe and the Mashatu team. Where it is: Tuli Block in the south-eastern corner of Botswana. Why go there: Cycling is more energetic than a game-drive and covers more ground than a bush-walk. Mashatu and its associated companies also offer horseback and vehicle safaris in long-view scenery with generous game populations. And the wildlife is really wild. What it has: A range of cycling safaris of different levels of comfort and discomfort. Take your own bicycle if it’s up to it or hire one from Mashatu. What it’s like: Periods of mild pain, interspersed with frequent moments of unforgettable glory. Rates: Accommodation at Mashatu Main Camp: R2464. Mashatu Tented Camp: R1792. Rates are per person and include meals, game drives and transfers to the border. SA residents only. 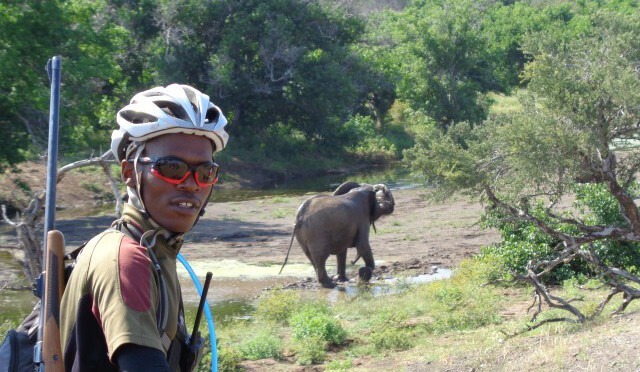 Cycle Mashatu offers a 3-night 4-day cycle tour from R4350 per person staying in rustic wilderness camps. Guests at all camps may take morning or afternoon bicycle safaris for $55 per person. Bikes and equipment are available for hire. Horseback safaris are available from $80 and walking safaris from $50. Geting there: Cross the Botswana border at Pont Drift, north of Alldays in Limpopo Province, leaving your car on the SA side of the river. You will be collected from here. It is a 6-hour drive from Johannesburg. A passport is required and you will need your vehicle papers in order to be allowed to leave your vehicle at the borderpost.